We are really grateful to you for every work you have awarded to me and my company, working for you has been fun, we hope for more work and opportunities from you, thank you and a happy New Year! Welcome responsibilities as it will increase your chances of being prosperous and successful in this New Year. Thanks for letting us serve you, happy New Year! As we are all waiting for a New Year with hope, I am thanking you for the opportunities you have given to us and wish a better New Year for you and your business, happy New Year! Thank you for giving us the chance to serve your business as a vendor. You are such a prestigious customer and we promise to always handle your work with top care and priority. Happy and Prosperous New year! It is a pleasure doing business with you, thank you for all the trust and work on us, we are looking forward to a new year filled with plenty of work and opportunities from you, once again wishing you a Happy and Prosperous New year! New Year is on the way and I really do thank you for all that business and opportunities you have given to me. Wishing you a prosperous New Year! Make sure you wake up each day with so much passion and drive to work. The company will recognize and appreciate the result of the efforts you have shown. Have a beautiful and wonderful New Year! Let us take a moment to examine ourselves and prepare a resolution on how we can be a better worker this year. Start right. Wishing you all a happy and successful New Year! May we all be a blessing to this company and may our company be a blessing to us as well, wishing you all a happy New Year! As the New Year approaches, give a moment of thought to the achievements and the failures of this year so that you know the right path for you. Have a happy and successful New Year! Last year has come and gone, we feel so lucky to get you as Customer. We are looking forward to a new year that brings new challenges and opportunities. Happy and Prosperous New year! Wishing your company a successful completion of the year, celebrating great results and important achievements. We hope that our partnership will reach new hights in this forthcoming year! New Year is about new heights and new achievements, new experience and new acquaintance. And I believe that with your persistence and industry you will achieve much. Happy New Year! This year we planted the seeds of our partnership and I believe that beautiful garden will grow in the coming year and we’ll reap benefits of our cooperation for a very long time. Happy New Year! May your workplace be as your second home where you feel safe and warm and where you got everything under control. Happy New Year! Another year and another set of a whole new change will come up but what you won’t have to change is the formula of hard work to get good results. Keep working hard and persevere to achieve your desired success. Happy New Year! Work is an integral part of our life and also a good source of happiness. That’s why I wish that your job bring you personal growth and career advancement, moral satisfaction, warm trustful relationships and wealth in the coming year. Happy New Year! For me, success has nothing to do with money and wealth. It should primarily include friendly and honest relationships with partners. I’m really happy we managed to establish relationship of trust and hope we can cooperate further. Happy New Year! My distinguished colleagues, before I became a member of this incredible team, I had never thought that words “work” and “pleasure” are compatible. But, working with you, I have become more and more convinced that it’s possible. Wish us all a very fruitful partnership in the coming year! Happy holiday! Every success requires an effort and a year of hard work proved it once again. Our united staff was able to overcome many professional challenges and developed into a very beautiful and effective mechanism. Hope the next year will be even better. Happy New Year! May you continue to trust and rely on our Company. We highly appreciate your continued support. Stay to be our first and number 1 client! Wishing you a prosperous New Year! It’s been a hard, but very fruitful year that brought good experience to all of us. I hope you also find our partnership very effective and look forward to further working relationship. Happy New Year! Dear colleagues, I feel like we’ve become so close in recent years that I can call you my second family. It’s a real pleasure to work and improve professional skills in such a wonderful and friendly atmosphere. Thank you for another beautiful year together. Happy holiday! I congratulate you on New Year and wish that all you accumulated wealth grow even faster in the coming year. An amazing New Year’s night to you! As a businessman, you always face a huge number of doors. Some of them are opened, some of them are closed, and you never know what is hiding behind them. Be brave enough to open each and every door that gets in your way. May the New Year bring you only good surprises behind those doors. May this New Year be filled with varieties of works to keep us busy, my wish is for our company to continue to grow so that we will earn more! Happy New Year to everyone! I want you to remember that business is not about making money, it’s always about making our world a better place by doing something special. Be patient and strong enough for avoiding temptations of dishonest life and always stay true to yourself. Happy New Year! We live in a world where business is often associated with dishonour and deceit. People lie and cheat to get the most benefit. May the New Year help you to realize that honesty and conscientiousness are the only things that can make you not only a great person, but a great businessman as well. Happy New Year! It obvious that you can’t build a prosperous business without faithful friends supporting you all the way through. It’s also impossible to keep it without cooperation with loyal partners. So my wish for you is to be surrounded by faithful and competent people during your journey to the great success. Happy New Year! Usually people think that business is all about logic and cold calculation. But a real businessman is someone who knows how to combine rational thinking with the voice that comes from his heart. I want you to learn to listen to this voice.Happy New Year! Thank you for every work you have given me, it has really helped our company to succeed in Business. We are passionately looking forward for a New Year filled with your support, happy New Year! Money doesn’t mean a thing if you are not using it for good. Always remember that experience is something that you should be able to share with everyone, even if you feel like they may become more successful than you. What’s yours will be yours. Happy New Year! We all fall down sometimes, feel like we’ve had enough and it doesn’t make any sense to keep fighting. But true winners always stay strong and faithful to their dreams. 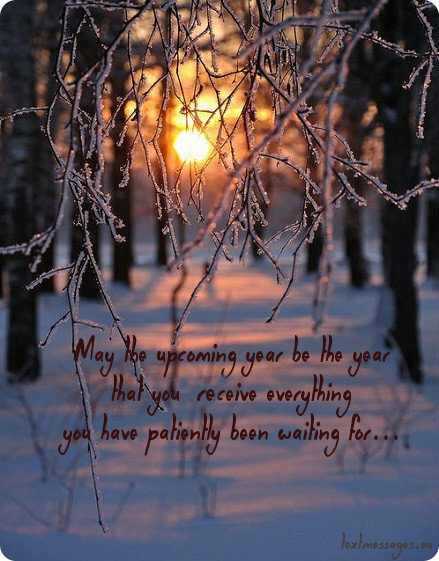 May this year bring you patience and strength to cope with all those problems that get in your way. Happy New Year! The New Year is a great opportunity to start making your dreams come true. Be brave enough to build your own business and patient enough to keep it prosperous. May this year become a great start for you. Happy New Year! Success is something that comes to those who really deserve it. You’ve been working hard this year, and I believe that the next year will be a year that will make your business bloom like a beautiful flower. Happy New Year! You are a great dreamer, and even greater achiever. 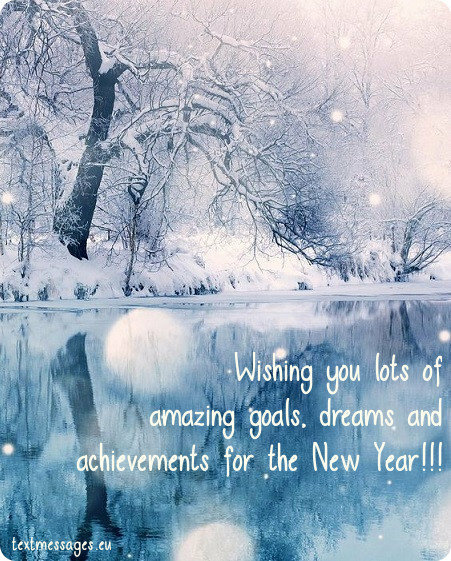 Wishing you lots of amazing goals, dreams and achievements for the New Year! Money is not something that makes us permanently happy, but it is something that helps us to make someone we love a little bit happier. I hope that your business will be successful and prosperous this year. Happy New Year! May the New Year bring you more opportunities for climbing up the career ladder! I wish you genuine success in all your professional pursuits in this New Year! We wish you a gratifying year, full of rewarding experiences and moments worth remembering! Dear colleague! May your workplace be like a home to you, where you feel comfortable and confident! Happy New Year! May the New Year bring you an abundance of endurance and inspiration in the difficult road of success! As we step into another year, I wish you confidence and courage to accept new challenges and work further towards your goals! May your success be great and your ambitions even greater, so that you don‘t stop and always have new targets to strive for. Have an eventful New Year! The New Year has come, don’t forget that everything is in your hand, so set your goals and push yourself to achieve them! May all your efforts in business gain even more success and recognition in this New Year! Bid farewell to the old year and welcome the new! May all your aspirations and efforts be generously rewarded in this upcoming year! 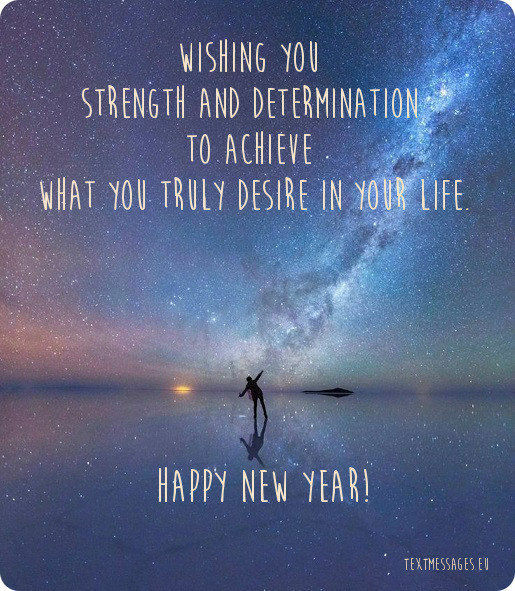 I wish you strength and determination to achieve your desired results in the coming year! As the year comes to an end, set yourself up for the successful beginning and new challenges, which are waiting for you. Happy New Year! Year 2017 is the year of the rooster – a very proud and confident bird that carries itself with dignity. May all this necessary qualities help you to emerge victorious every time! Happy New Year!